Robert Darnton, the new director of the Harvard University Library, discusses the historical relevance of French songs, which were performed by Helene Delavault and George H. Blaustein at “A Lecture Cabaret” in the Radcliffe Gymnasium last night. 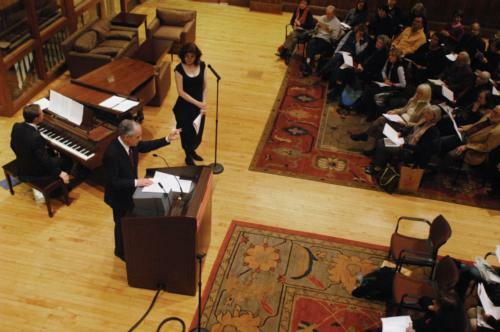 Darnton, who concentrated in history and literature at Harvard, said that he came upon the idea of a “cabaret lecture” while researching French police archives. In these archives, he found dozens of “chansonniers,” or songbooks in which the lyrics of songs poking fun at prominent French figures were copied. After Darnton gave some brief historical background for each song, Delavault—“specially imported from Paris” as Darnton put it—revived the old tunes, accompanied by pianist and history and literature teaching fellow George H. Blaustein. The first song in the program, a “lovely lyrical song,” was followed by a second, parodied version that, according to Darnton, helped topple the French government in 1749. Darnton said that at a dinner Maurepas attended, Madame de Pompadour—the king’s mistress—gave white hyacinths to the king. The term “fleurs blanches,” or white flowers, appears in the song as a play on the term “flueurs blanches,” which refers to a venereal disease—suggesting that Pompadour had infected the king. Maurepas was assumed to have composed the incendiary song, and was stripped of power soon after. Most of the other songs also satirized figures in power at the time, especially Louis XV and Pompadour. “[Pompadour] was a great target because of her maiden name, ‘puissant,’ or fish,” Darnton said. “The [Parisians] couldn’t resist the temptation for puns. Delavault underscored the many risque puns with drastic changes in the inflection of her voice. —Staff writer Angela A. Sun can be reached at asun@fas.harvard.edu.